We are a leading Manufacturer of offset newspaper printing machine, newspaper printing machine, automatic newspaper printing machine and newspaper printing press machine from Faridabad, India. We are the prominent organization of this domain engaged in offering a wide spectrum of Offset Newspaper Printing Machine. This machine offers reliability and quality even at high speeds. The provided machine runs at maximum speed of 36,000 copies per hour. In addition, the machine delivers low life cycle costs, and low costs per copy. 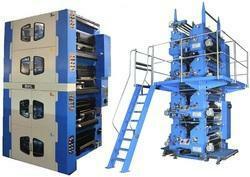 It is a very heavy duty high speed machine for the daily news paper circulation. This machine equips folder based 2:2 principal. Therefore, the folder can handle 6-8 webs for production of 24-32 pages of broad sheet news paper. 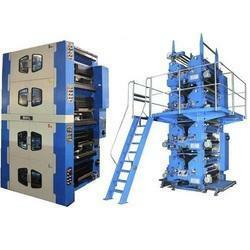 We are one of the leading manufacturer and supplier of Newspaper Printing Machine. Circular printing with variety in colors, pagination, and capable of printing 4 color on either side of the web (4+4). Screw-type swing-down ink fountain with overrides for ink fountain roller. Dynamically-balanced hard chrome plated solid plate and blanket cylinders. On the nose, slit or spring-type plate lock-up system. Manual side register system for both plate cylinders, on the run. Provision for printing 4 colours on both sides of one web, or 2 colours on both sides of two webs, or single colour on both sides of three webs. On the run manual adjustment for registration of 4 colours on each side of web. As an affluent name of this domain, we hold expertise in presenting high quality Automatic Newspaper Printing Machine. This machine is capable of printing one color on either side of the web. On the other hand, a 2+0 color combination can also be attained using direct litho printing. In addition, the stack unit is identical to the mono unit, but is without the reel stand. Furthermore, this machine can be mounted without the reel stand. Besides, it can print a 3-color satellite to print 4+1 and on a mono unit to print 2+2. As a trust worthy organization of this domain, we are committed to offer our clients a superior quality assortment of Newspaper Printing Press Machine. The provided newspaper printing machine is equipped with three printing couples surrounding by a stainless steel common impression cylinder that facilitates 3-colour printing. The 3 color satellite is capable of printing 3+0, 2+1 or 1+2 color combinations on one web. In addition, the offered machine has the nose, slit or spring-type plate lock-up system. This machine is manufactured adhering to industry standards and quality norms. Lever-type swing-down ink fountain with overrides for ink fountain roller.